Unquestionably CirkVOST have an excellent wheel. Built from dark metal, two towering rings are joined by an intricate tangled network of ropes, pulleys and looping bars. Old hanging lights cast their glow in the centre; a dark plane of netting stretches the bottom. Tiny figures climb around like sailors through rigging, up to the top of the structure and almost to the apex of the tent. You could sail a ship through the centre. 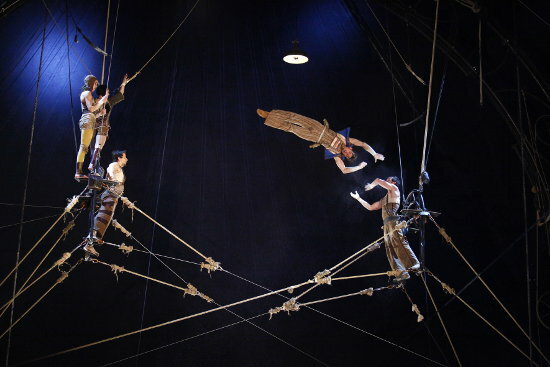 It's an extraordinary piece of equipment, constructed at great expense to custom specifications for the first show from CirkVOST, a new company formed from the rebanded members of the disbanded and once-great flying troupe Les Arts Sauts. The audience are seated in reclined deck chairs with fitted neck pillows so that they can lie back and gaze up – it's all just so, and obviously for one or more of the company the realisation of a long-held dream. Yet in Epicycle you feel that, by getting what they want, VOST have removed the necessity of invention and transformation, and with their first show have ossified and stuck in place. Epicycle is a style, a look. Clutter, junkyard complexity, overt mechanics. The performers wear leather-ish trousers, goggles, braces, lighted miners' helmets; a musician/technician, lit by the omnidirectional glow of several open laptops, is housed alongside the wheel in a kind of hanging basket embedded with cogs and running gear-chains that floats over a giant slow-turning propeller. Like a lot of steampunk, it's committed and grand but also witless – is the wheel a home, a vessel, a place of work? In fact none of these, and Epicycle's interest is neither in creating a narrative context for the structure, nor, more abstractly, in unpacking the associations and suggestions of its design. What grace there is comes from simple effects – during a doubles swinging trapeze when a tiny fall of paper helicopters is released, or when the dark canvas of the tent behind is slowly picked out in stars – and I liked the principle male flyer and his apparent looseness in the air, but the technical material in the show, while accomplished, is honestly kind of repetitive: throwing people on the cradle, then between two cradles, then between another two cradles that are higher up and further apart, then with a swinging cradle. There are two possible planes of movement – with the ring and counter to it – and there's no room for flying trapeze. The structure is 13 metres in diameter and they make it seem both extravagant and insufficient. Also, though: what next? Presumably the company will in short order run through the festivals and venues that can afford to programme them. And then? I like to imagine the wheel moved to the desert and opened as a creation centre – or left there forever as the artefact of an ancient folly – but probably it'll stick with the company and define their work going forward: it's striking and exceptional, but even if it's everything they asked for, I wonder if in the end it will give them what they want. For more on CirkVOST precursors Les Arts Sauts see their interview and profile in the book Panorama contemporain des arts du cirque. Les Arts Sauts are also featured on the double-DVD compilation Le Nuancier du Cirque.